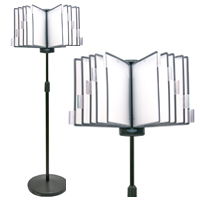 The X-Style Flip and Find Display Carousel keeps large amounts of frequently referenced information organized, easy to read, and retrievable at a moment's notice. The display carousel takes up minimal room on the desk top, yet provides storage for up to eighty pages in forty double-sided display panels. The anti-glare display panels are notched at the top for easy loading, and can accommodate papers up to US-Letter sized (8.5" by 11"). The panels have sturdy, durable edges to allow fast page turning and to provide rigid support for papers. Index tabs and labels are included to allow the user to create an organizational structure. The X-Style Flip and Find Display Carousel is designed to rotate a full 360º and is supported on a weighted base to ensure stability. The Flip & Find Adjustable Floor Stand Reference Organizer can be used at seated or standing workstations, in restaurants, at tradeshows or anywhere else reference information needs to be organized, easy to share, and retrievable at a moment's notice. The pole-mounted unit is height-adjustable and supported on a weighted base to ensure stability. At its minimum height of 43.3" the Adjustable Floor Stand Reference Organizer would function well beside a traditional desk; at its maximum height of 64.2" it would work well beside a standing workstation or service counter. The angle of the organizer can be adjusted along with the height, allowing users to select the most comfortable view. The Flip & Find Adjustable Floor Stand Reference Organizer provides storage for up to twenty pages in ten double-sided display panels. The 8.5" x 11" display panels are double sided anti-glare transparent sheaths with a semi-rigid edge to protect reference materials from spills, dust and oils/grime which will otherwise often accumulate on frequently handled papers. The extra weight and rigidity afforded by the panels makes it easier to Flip through the materials and Find the desired information efficiently. The Flip & Find Adjustable Floor Stand Reference Organizer is easy to assemble and disassemble without tools. 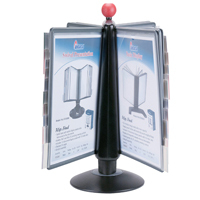 The Whiteboard Copy Holder Flip and Find Display Carousel is a multi-purpose desk accessory designed to reduce the frustration of having to hunt for frequently needed information at a moment's notice. The display carousel takes up minimal room on the desk top and keeps checklists, flowcharts, part numbers, policies, procedures and fact-checking data immediately retrievable. 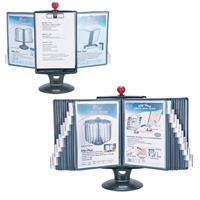 Twenty double-sided display panels are included, which allow forty documents to be displayed. Also included are index tabs and labels to organize the materials. The anti-glare display panels are notched at the top for easy loading, and can accommodate papers up to US-Letter sized (8.5" by 11"). The panels have sturdy, durable edges to allow fast page turning and to keep papers neat and readable. On the back of the unit is a white steel 8.5" by 11" dry erase board with a document clip, allowing this feature to do double-duty as whiteboard and copy holder. A black dry erase marker and an eraser are included and can be stored in the tray along the lower edge of the whiteboard. The Whiteboard Copy Holder Flip and Find Display Carousel is designed to swivel a full 360º and is supported on a weighted base to ensure stability.